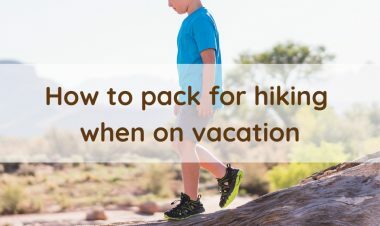 As we head into summer, one thing we need to prep for while out hiking is the surprise shower. When I visited the mountains in North Carolina and Colorado, I discovered that you need to be prepared for all kinds of weather while out on trail. Wisconsin is a bit more predictable on weather, but the rain showers can be bone-chilling even in July. I’ve learned to carry a rain jacket on trail as it can work as a lightweight layer, a windbreaker and, of course, a raincoat. 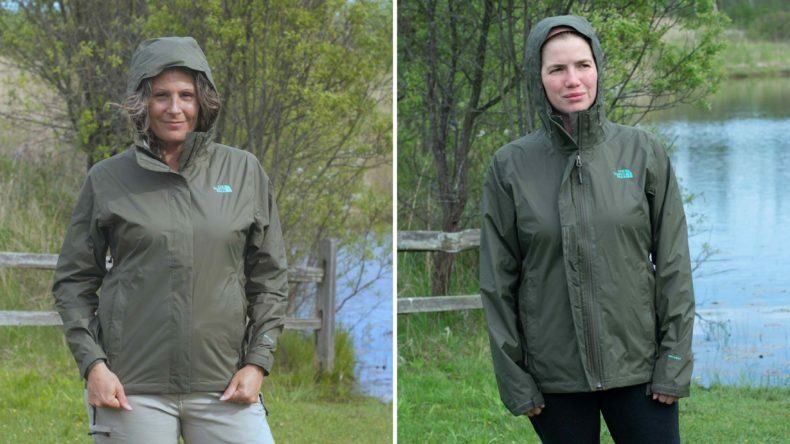 When looking at raincoats, there are so many different styles and features. But one important factor is how the jacket fits you. 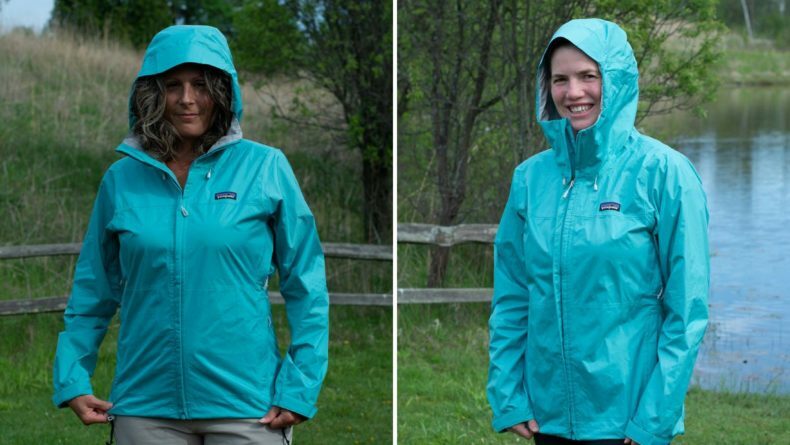 Here, we’re taking a look at six different rain jackets to help you find your best fit. 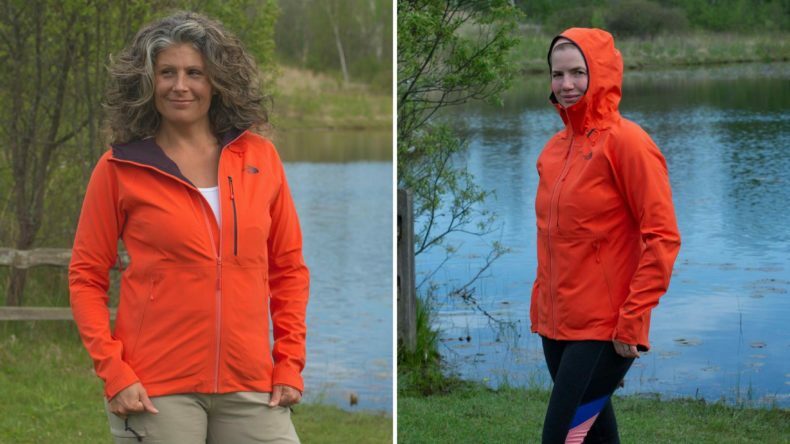 Each jacket was tested on Julie and myself to see how they fit and move. Julie is 5’ 8”, a size 8-10 and normally wears either a medium or large. I’m 5’3”, a size 6, and normally wear a medium but could wear a small depending on style. This way you can see if you need to size up or stay at your normal size. I took the North Face Venture 2 to North Carolina and was so glad to have it along. Between its light weight and pit vents, it was great in the humid Great Smoky air. We had a sudden downpour, and this was great at keeping me and my camera dry. There are two large pockets on this jacket, and my iPhone 7 Plus easily fit inside. This jacket did pack down small as well to fit into my backpack, and it can be stuffed into the hand pocket. As for fit, this fit me and Julie well throughout the chest and hips with plenty of room for wider hips. The arms were a great length for Julie and the adjustable wrists made it work well for me. 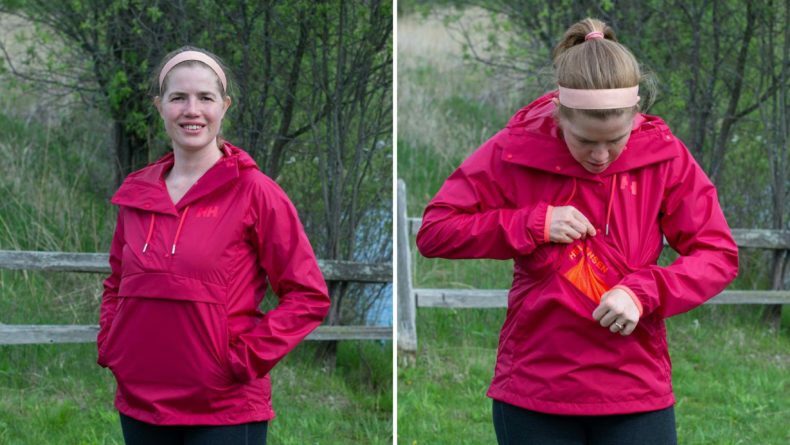 The hood on this jacket has several adjustment points – including one in the back – so you can tighten it and get a great fit over your face and hair. The brim of this hood isn’t super stiff, so it molds well around the face. The North Face also has a Fit Finder that asks a few questions so you can get a better fit. This is easy to use, and you don’t need to know your exact measurements – just your general information like height and weight. The North Face Venture 2 also comes in XXL and 3XL, so it will fit all sizes. Those who experience a longer shoulder season will want to look into the North Face Apex Flex GTX 2.0 ($249). 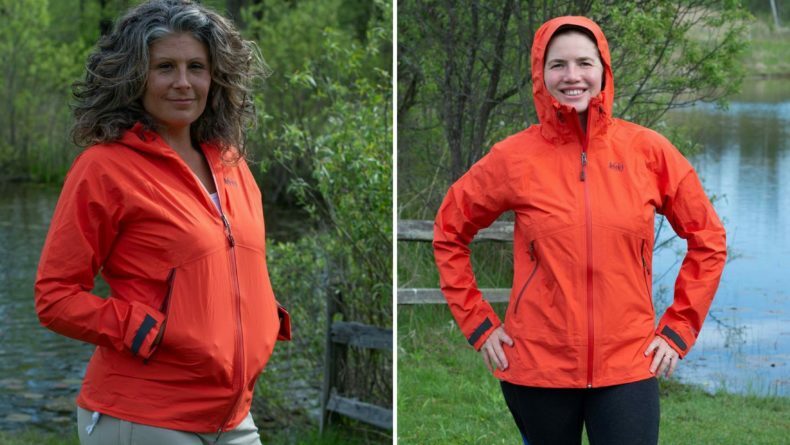 It’s a thicker style that will keep you warmer on those rainy, chilly hikes. This thicker rain jacket also works wonders on those snowy or slushy days. This is a great hybrid between a winter coat and a rain jacket. For those who experience milder winters, this would do well as a winter coat that is waterproof. I was able to wear this coat down to 40 degrees without a long-sleeve shirt and only wore a wool base layer with it to play in our April blizzard. 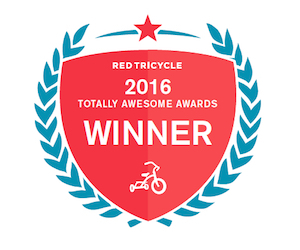 (Thanks, Wisconsin!) This jacket worked great for a mid-spring backpacking trip with cooler evenings. It packs away decently for its thickness and also works great as a seat during the day. It doesn’t pack down into itself but is worth the space on chilly days. The jacket provided ample room through the chest for me and Julie. It was tighter along the hips for Julie but not so tight that she wouldn’t be able to layer underneath. I found it very comfortable in fit for my size. The arms were a bit tight when I first put on the jacket but they loosened up well with use. One thing I loved (other than the thickness of this jacket) was the great pockets. There are three different pockets, and the chest pocket is large enough for my iPhone 7 with its large case. This jacket also has pit vents. The hood on this one does tighten down, giving you a good fit for keeping the slush out. 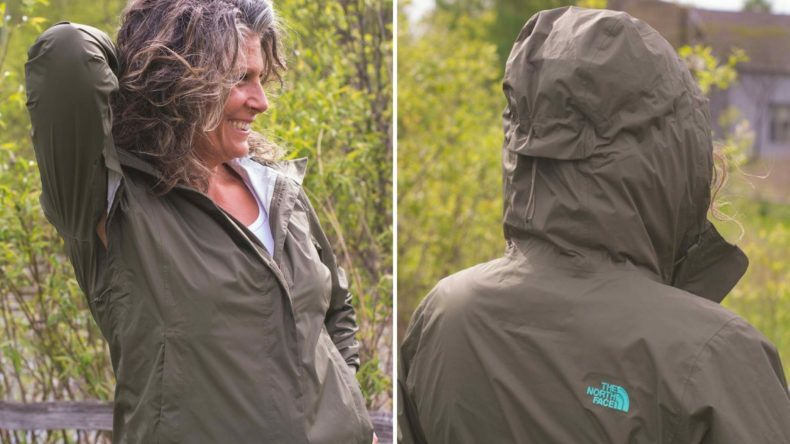 The lightweight, packable Patagonia Torrentshell Jacket ($129) is a great item to keep in your to-go bag. The H2No® Performance Standard that lines the jacket is awesome for keeping you dry on those torrential downpours while still being breathable. I’ve used these on a few hikes in our long winter, and it was roomy enough for layers and did a good job of keeping the wind out. With the pit vents, it’s also done well on warmer days to keep me cool in the rain. This jacket fits well in the chest and hips for me and Julie. It was a little roomier than the North Face jacket, so Julie enjoyed the extra hip space. 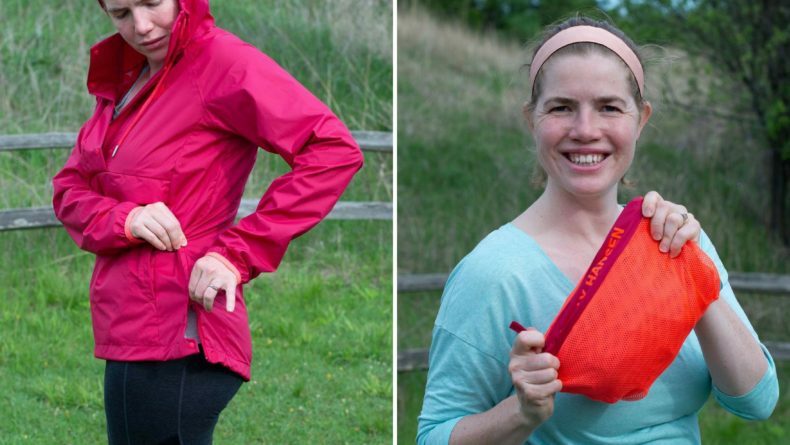 Even though it’s a bit roomier, it does cinch down at the hips, wrists and around the hood. I liked the cord around the hood as you only needed to pull down to cinch, so it’s very intuitive. 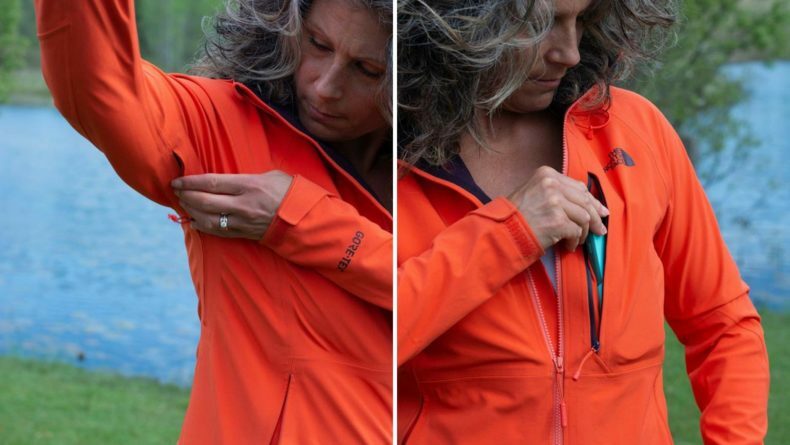 This jacket also stows away into its pocket for throwing in your pack before heading out on trail. 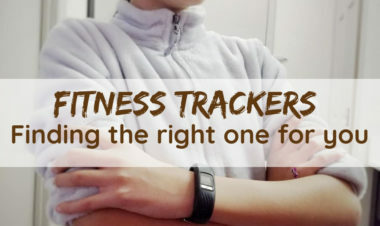 Patagonia also offers a Fit Finder, so it’s easy to figure out what size would work best for you. The Helly Hansen Loke Packable Anorak ($100) is a quick-to-get-on jacket for those sudden bursts of rain. This jacket is different from everything on the list and did well going from pack to back quickly. It doesn’t have a zipper up to the chin, and the snaps make it easy to get a bit more ventilation. The snaps do go low enough that I would be able to breastfeed in this as well if needed. The hood is different as it doesn’t have a typical reinforced brim. 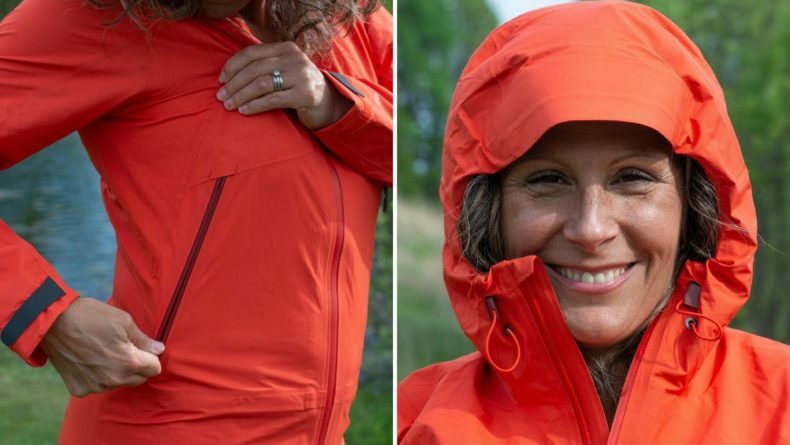 This allows the hood to size down as small as needed. The Loke Packable Anorak fit me well. However, Julie wasn’t able to get it over her shoulders. The side zipper makes it convenient to get on and off. The sleeves were long for me, so they would work well on someone who is taller. The big winner for me on this jacket is the pocket. The front kangaroo pocket is deep enough that my phone wouldn’t fall out and I can put my hands together for warmth. In addition to the kangaroo pocket, there is a zippered pocket that also functions as the pouch. It flips between the stuff pouch and use. I found this very useful for when my child wanted to run off ahead and I wasn’t left behind trying to stuff a jacket into its pouch. For those who like a pullover style of jacket, this is one to look into. When the Toad and Co Aquarius ($149) first arrived, I was a bit concerned with how it would perform in the rain with its open sides. However, this jacket exceeded expectations and performs great in downpours. The split sides make this great for women who are a medium in the chest and have a bit bigger hips. This jacket was flattering for the both of us. The collar has a hidden lightweight hood, which is pretty basic without any frills. 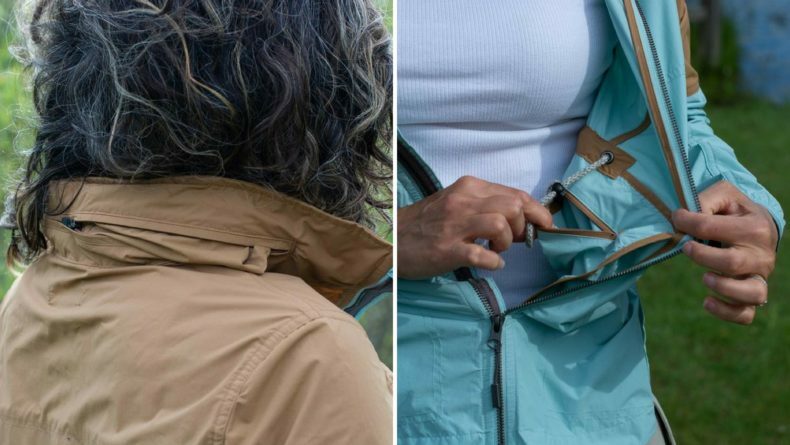 The frills on this jacket come from its five pockets (two hand, two breast and an interior zip pocket) and its ability to cinch in at the waist. Both Julie and I found this roomy. The wrists are an elastic band, so the arms can’t be sized down similar to many of the different coats we tried. 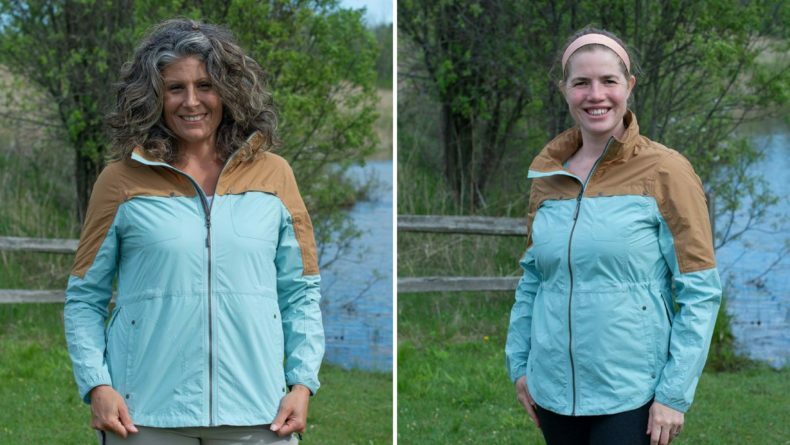 This jacket is a great buy for those who want something that looks great with jeans and can perform on the trail. The REI Co-op Drypoint GTX ($249) jacket is designed for the backcountry. If you are looking for something perfect for backpacking or keeping cool while carrying babies, this is one to try. While most jackets have either pit vents or some type of venting on the back, this jacket puts the venting in the pockets. I was doubtful when I first took it out, but it’s worth all 8.6 ounces, and I loved how well it kept me cool. Wisconsin is humid, and Milwaukee might be even more so since we are on a lake, so making sure the jacket is functional and not overheating is important. REI really nailed it on this jacket. They put the zippered pockets up a bit higher, and this makes a big difference when carrying children. With most zippers I can’t access when I carry Sky, but since these are higher, I was able to quickly access my phone or cool off. The size medium fit me well but was a bit snug around the chest and hips for Julie. This jacket also comes in plus sizes. The sleeve length was good for both of us with its adjustable wrists. The brim is stiff, and the hood sizes down well. All of the photos for this piece were shot by Jessica Featherstone. Products were provided by the companies, free of fee, but in no way was the reporting altered based on the donation of these products. We were honest in all of our reporting and picked these brands purposefully because we felt they were excellent representations of a variety of sizes and price ranges. 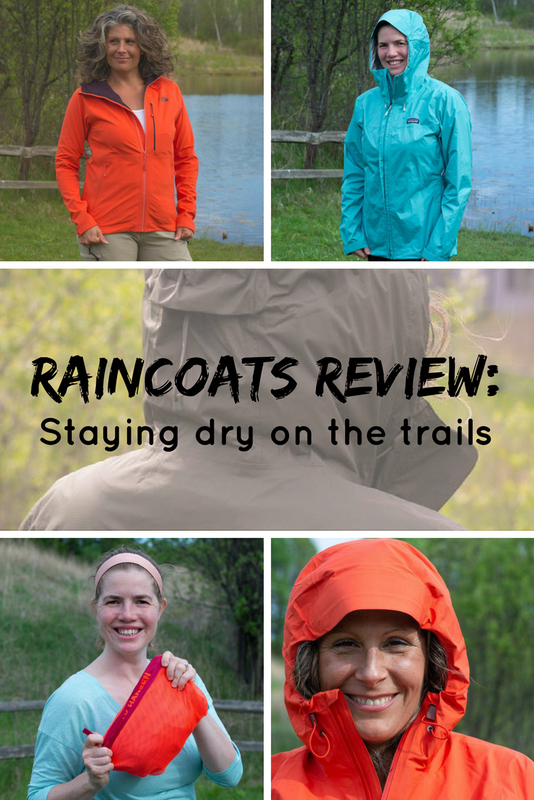 If you hike with a raincoat not mentioned here, please share with us in the comments below. Gear hiking in rain, Raincoats. permalink.